Go to Start > Devices and Printers. From the menu bar click the Add printer tab, then select Add a network, wireless, or Bluetooth printer. 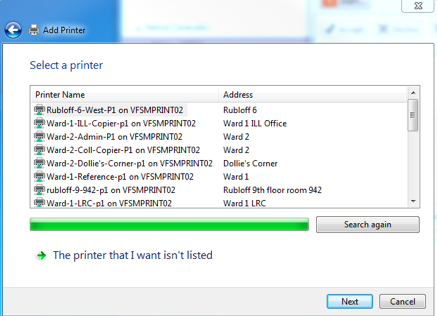 Click The printer that I want isn't listed. 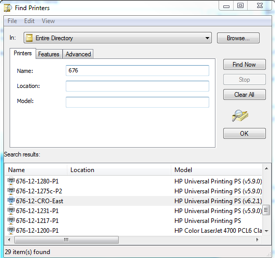 Select the Find a printer in the directory radio button and click Next. In the Name field enter the appropriate information to find your printer. It may be the name of your building (e.g., ward, 680, or 633); or it may be your department's name cases it may be your department (e.g., MSS). Click Find Now, and scroll to the correct printer for your floor. 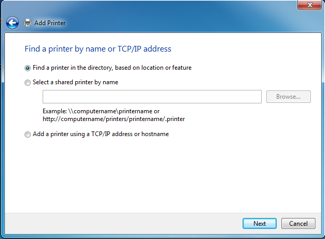 Double click your desired printer to begin installation of its printer driver. For additional assistance please contact Feinberg IT at fsmhelp@northwestern.edu, or call the IT Support Center at 847-491-4357 (1-HELP) option 5.